The Futurelooks Wall-Sit Endurance Challenge has been known by many names in the past. At Fragapalooza 2009 it was called the "GIGABYTE Ultra Durable Challenge". 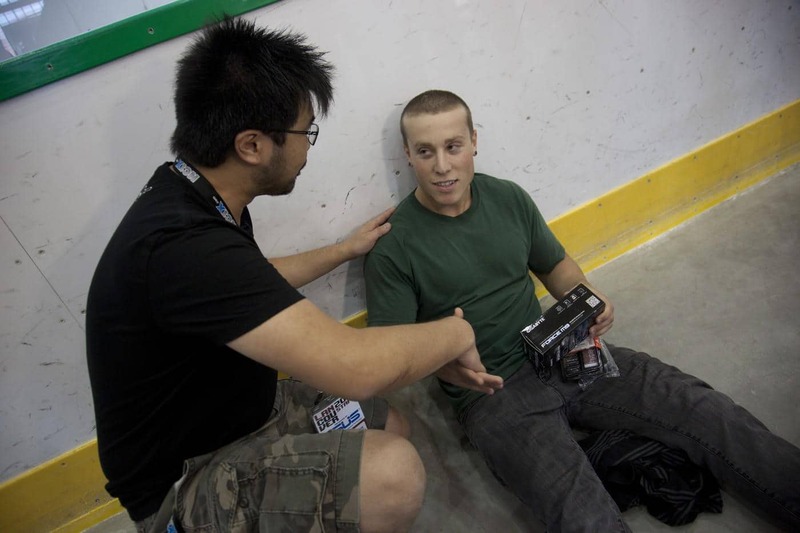 Then at LANcouver 2011, it was called the "GIGABYTE G1-Killer Endurance Challenge". But with ASUS as the presenting sponsor of LANcouver 2012, you know that's not going to "sit well" with them. Especially if we're giving away awesome prizes from a competitor. So we had a huddle with the ASUS gang, and we came up with a great solution. They ante'd up with equally awesome prizes and we get to call it the "Futurelooks Wall-Sit Endurance Challenge Presented by ASUS" instead! Check out the video above and feel the PAIN! We originally planned this contest to run at midnight on Saturday, but in order to give everyone some incentive for sticking around, we changed it up and set a time of around 2PM for it to start. 2PM became 3PM, then at 4PM and all the sponsors were already starting to pack up. Heck, I was pretty hungry as you can hear in the video with my hankering for bacon. 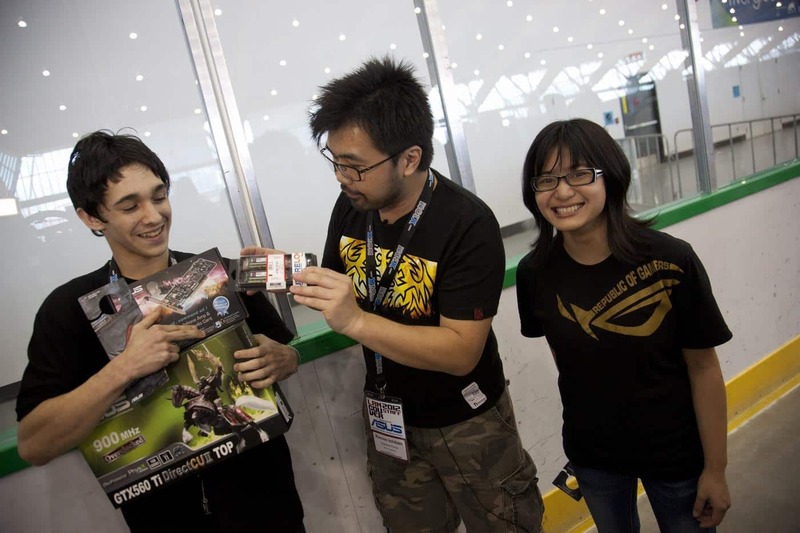 But it did buy us and ASUS some time to make some calls, visit the NCIX store, and come up with some replacement prizes for the contest. Then just after 4PM, we called for challengers in the most painful event of LANcouver 2012. With time running out and the end of LANcouver 2012 just a mere hour away, we had to figure out some way to expedite the challenge. So with the help of the entire ASUS ROG Event team, we brutally enforced the wall-sitting rules, leaving no more competitor harassed. The form had to be "Persistent Perfection" as Steve Kofoed of ASUS came around with the ban hammer, knocking down any competitor that couldn't keep their form or deviated from generally accepted wall sitting practices. This lead some people to tumble over in agony. Some even cried. The only relief that any of the competitors had at this year's event was to either succumb to pain, succumb to Steve's brutality, or accept a bribe from yours truly, to give up , and quit. Unsurprisingly, we had a lot of people wanting to quit for things as small as a mouse pad. It was that brutal this year and with the smooth cement surface, and the slippery boards of the hockey rink, it was made all the more challenging for even the most hardened of competitors. Competitors dropped out quickly and the smart ones accepted bribes and ran, but showdown came down to two individuals that would duke it out for all the glory. Quitters Win but Winners Get The Best Prizes! At the end of the competition, one wall sitter reigned supreme and walked away with an ASUS Xonar Audio Card, an ASUS GTX 560 Ti Direct CUII TOP graphics card, and a Kingston HyperX PnP DDR3 notebook memory kit. That made Patti from ASUS very happy as we can see in the photo above. The valiant effort of the second place winner did not go unrewarded. He walked away with a limp, a GIGABYTE Wireless Mouse, that apparently lasts 2 years on a single charge, an NVIDIA computer tool kit, and a Kingston HyperX PnP DDR3 Notebook Memory Kit. He got a handshake from me too, but I think he needed a medic more. I'd like to give ASUS a special round of applause for getting right into this event and showing true ROG spirit in their quest for "Persistent Perfection" of the wall sitting position. Steve, Dennis and Patti were all over this and their enthusiasm really motivated the crowd. While the time was probably one of the worst of any wall sit we've EVER done, we expect that there will be some challengers training to beat our time of 0:09:28 LANcouver 2012 Record at the Richmond Oval, which was once home to the 2010 Winter Games Speed Skating events. We'll see you next year at LANcouver 2013! Please enjoy the photos courtesy of the Official LANcouver Facebook Page.